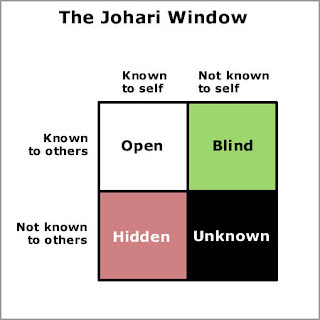 The Johari Window, named after the first names of its inventors, Joseph Luft and Harry Ingham, is one of the most useful models describing the process of human interaction. A four paned "window," as illustrated above, divides personal awareness into four different types, as represented by its four quadrants: open, hidden, blind, and unknown. The lines dividing the four panes are like window shades, which can move as an interaction progresses.In this model, each person is represented by their own window. Johari region 1 is also known as the 'area of free activity'. This is the information about the person - behavior, attitude, feelings, emotion, knowledge, experience, skills, views, etc - known by the person ('the self') and known by the group ('others'). For example in my case the "open" quadrant represents things that both I know about myself, and that you know about me. For example, I know my name. The knowledge that the window represents, can include not only factual information, but my feelings, motives, behaviors, wants, needs and desires... indeed, any information describing who I am. When I first meet a new person, the size of the opening of this first quadrant is not very large, since there has been little time to exchange information. The aim in any group should always be to develop the 'open area' for every person, because when we work in this area with others we are at our most effective and productive and the group is at its most productive too. The open free area, or 'the arena', can be seen as the space where good communications and cooperation occur, free from distractions, mistrust, confusion, conflict and misunderstanding. Established team members logically tend to have larger open areas than new team members. New team members start with relatively small open areas because relatively little knowledge about the new team member is shared. The size of the open area can be expanded horizontally into the blind space, by seeking and actively listening to feedback from other group members. This process is known as 'feedback solicitation'. Also, other group members can help a team member expand their open area by offering feedback, sensitively of course. The size of the open area can also be expanded vertically downwards into the hidden or avoided space by the person's disclosure of information, feelings, etc about him/herself to the group and group members. Also, group members can help a person expand their open area into the hidden area by asking the person about him/herself. Managers and team leaders can play an important role in facilitating feedback and disclosure among group members, and in directly giving feedback to individuals about their own blind areas. Leaders also have a big responsibility to promote a culture and expectation for open, honest, positive, helpful, constructive, sensitive communications, and the sharing of knowledge throughout their organization. Top performing groups, departments, companies and organizations always tend to have a culture of open positive communication, so encouraging the positive development of the 'open area' or 'open self' for everyone is a simple yet fundamental aspect of effective leadership. Johari region 2 is what is known about a person by others in the group, but is unknown by the person him/herself. For example in my case the "blind" quadrant represents things that you know about me, but that I am unaware of. For example, perhaps in our ongoing conversation, you may notice that eye contact seems to be lacking. You may not say anything, since you may not want to embarrass me, or you may draw your own inferences that perhaps I am being insincere. Then the problem is how I can get this information out in the open.By seeking or soliciting feedback from others, the aim should be to reduce this area and thereby to increase the open area ie, to increase self-awareness. This blind area is not an effective or productive space for individuals or groups. This blind area could also be referred to as ignorance about oneself, or issues in which one is deluded. A blind area could also include issues that others are deliberately withholding from a person. We all know how difficult it is to work well when kept in the dark. No-one works well when subject to 'mushroom management'. People who are 'thick-skinned' tend to have a large 'blind area'. Group members and managers can take some responsibility for helping an individual to reduce their blind area - in turn increasing the open area - by giving sensitive feedback and encouraging disclosure. Managers should promote a climate of non-judgmental feedback, and group response to individual disclosure, which reduces fear and therefore encourages both processes to happen. The extent to which an individual seeks feedback, and the issues on which feedback is sought, must always be at the individual's own discretion. Some people are more resilient than others - care needs to be taken to avoid causing emotional upset. Johari region 3 is what is known to us but kept hidden from, and therefore unknown, to others. This hidden or avoided self represents information, feelings, etc, anything that a person knows about him/self, but which is not revealed or is kept hidden from others. The hidden area could also include sensitivities, fears, hidden agendas, manipulative intentions, and secrets - anything that a person knows but does not reveal, for whatever reason. It's natural for very personal and private information and feelings to remain hidden, indeed, certain information, feelings and experiences have no bearing on work, and so can and should remain hidden. However, typically, a lot of hidden information is not very personal, it is work- or performance-related, and so is better positioned in the open area. Relevant hidden information and feelings, etc, should be moved into the open area through the process of 'disclosure'. The aim should be to disclose and expose relevant information and feelings - hence the Johari Window terminology 'self-disclosure' and 'exposure process', thereby increasing the open area. By telling others how we feel and other information about ourselves we reduce the hidden area, and increase the open area, which enables better understanding, cooperation, trust, team-working effectiveness and productivity. Reducing hidden areas also reduces the potential for confusion, misunderstanding, poor communication, etc, which all distract from and undermine team effectiveness. Organizational culture and working atmosphere have a major influence on group members' preparedness to disclose their hidden selves. Most people fear judgment or vulnerability and therefore hold back hidden information and feelings, etc, that if moved into the open area, ie known by the group as well, would enhance mutual understanding, and thereby improve group awareness, enabling better individual performance and group effectiveness. The extent to which an individual discloses personal feelings and information, and the issues which are disclosed, and to whom, must always be at the individual's own discretion. Some people are more keen and able than others to disclose. People should disclose at a pace and depth that they find personally comfortable. As with feedback, some people are more resilient than others - care needs to be taken to avoid causing emotional upset. Johari region 4 contains information, feelings, latent abilities, aptitudes, experiences etc, that are unknown to the person him/herself and unknown to others in the group. These unknown issues take a variety of forms: they can be feelings, behaviors, attitudes, capabilities, aptitudes, which can be quite close to the surface, and which can be positive and useful, or they can be deeper aspects of a person's personality, influencing his/her behavior to various degrees. Large unknown areas would typically be expected in younger people, and people who lack experience or self-belief.